Consumer prices in Britain fell 0.1 percent in April in annual terms, which marked the first deflationary reading in more than half a century. However, the Bank of England says it should be short-lived and prices will pick up soon. It is the first time Britain has seen deflationary consumer prices since inflation started to be tracked in 1960, the Office for National Statistics (ONS) saidTuesday. Official records started in 1996. 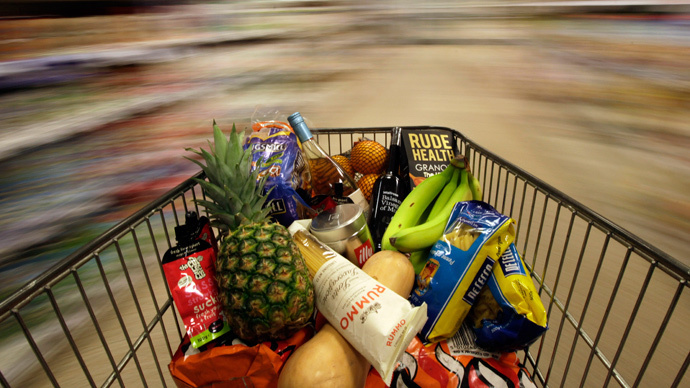 The deflationary figure means a basket of goods costing £100 in April 2014, cost £99.90 in April this year. The Bank of England Governor Mark Carney stressed that the decline was primarily caused by falling oil prices, not weak domestic demand, adding that Britons should enjoy a lower cost of living before inflation rebounds. A growing pound also drove prices lower, as it cut the cost of imports. "We expect inflation to be very low over the next few months. But over the course of the year, as we get towards the end, inflation should start to pick up towards our 2 percent target," Carney told broadcasters. Labour’s Shadow Chancellor Chris Leslie wasn’t that optimistic saying the Government needs to show more effort to raise living standards and to guarantee sustainable growth. “Any relief for households is welcome, but this month’s figures reflect global trends and doesn’t change the reality that many are still struggling to pay the bills,” he said. Economists are confused whether to call this situation deflation or negative inflation. The Office for National Statistics used the headline “UK enters deflation” on Tuesday morning. “We prefer to classify this as ‘negative inflation’, with deflation more strictly defined as a period of falling prices that are both sustained and general,” said Investec’s Philip Shaw, adding that the negative April trend will not continue.